Our next home is a fashionable addition that has been created atop a garage – a space that many people do not typically use. 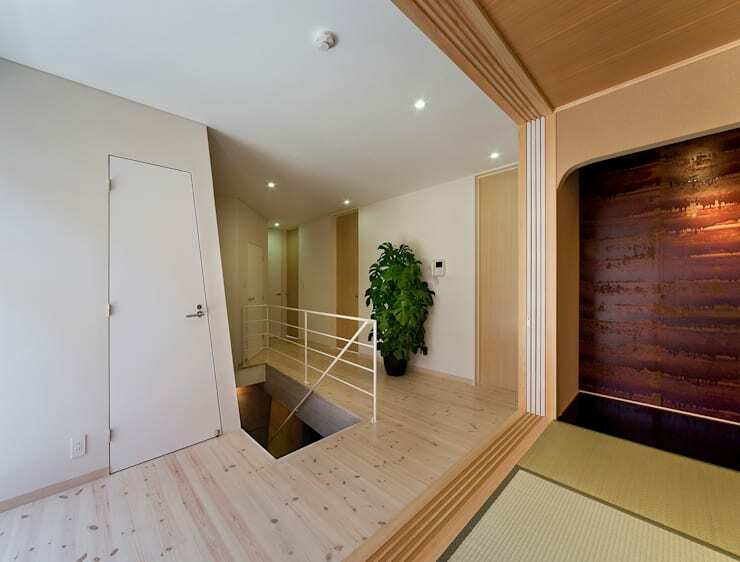 A linear style home especially does not support the use of this space. 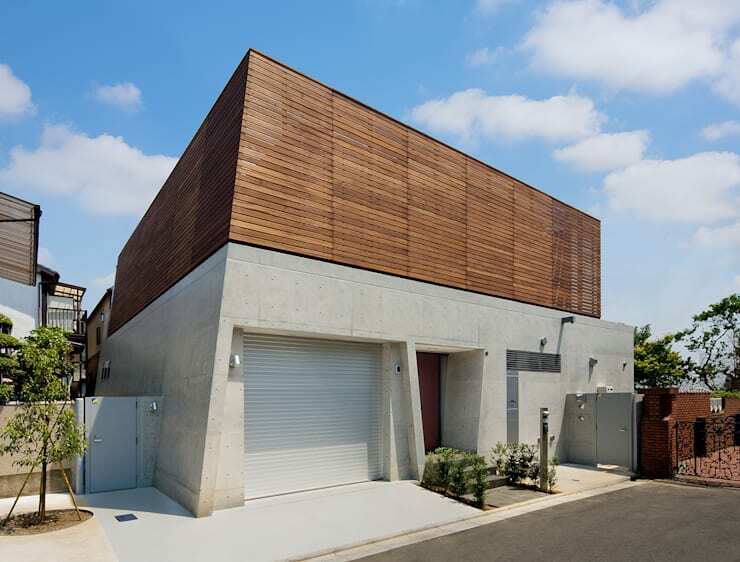 Yet the designers and architects from Morimoto Atelier in Chiba Prefecture have managed to create an extension with the use of many mixed materials for a chic warehouse-style look. This 2,960 square foot space has been put to good use with a hint of the Orient and a generous smattering of robust modern style. The very facade of this space brings on an Oriental touch to its look. The wooden slats come together for a neat and almost woven appearance with lots of symmetry at play. 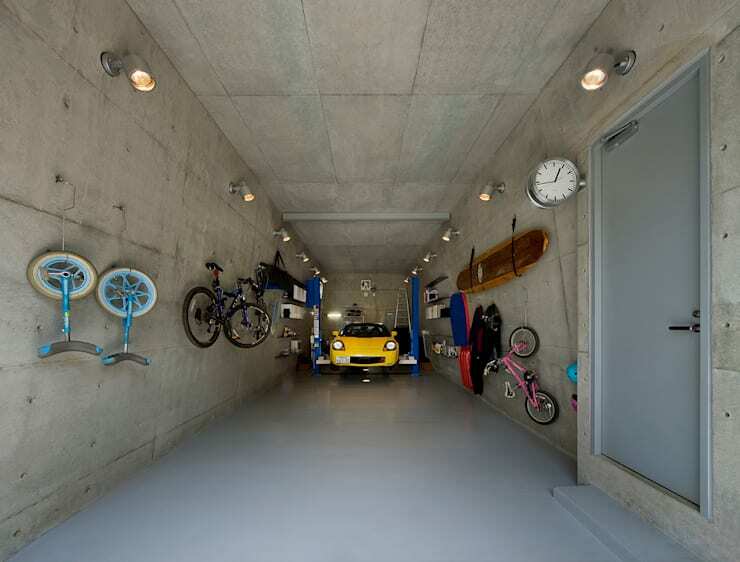 The exposed cement facade of the garage below ensures that there is a delicate balance at play in the basic design scheme of the home. 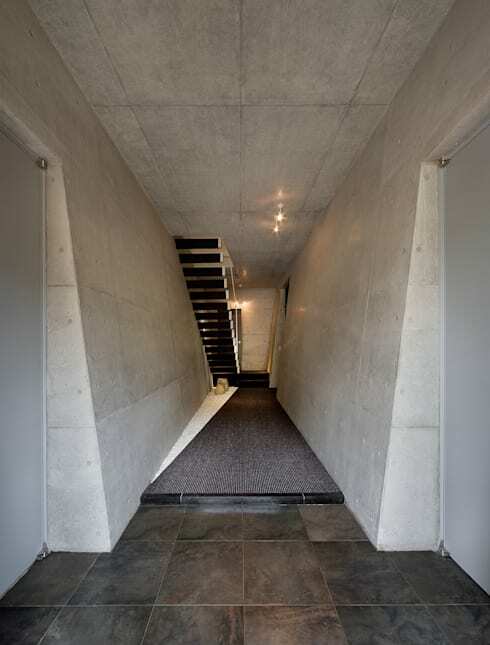 The warehouse look has been handled with the help of rich flagstone tiles and exposed cement walls, which tunnel into an asymmetrical look. The angles of the walls and the scale of the space, despite the narrow area, ensures that the robust and the industrial go hand in hand. The bright blue wall is one that sits well with the matte texture of the black fixtures and fittings in this room. 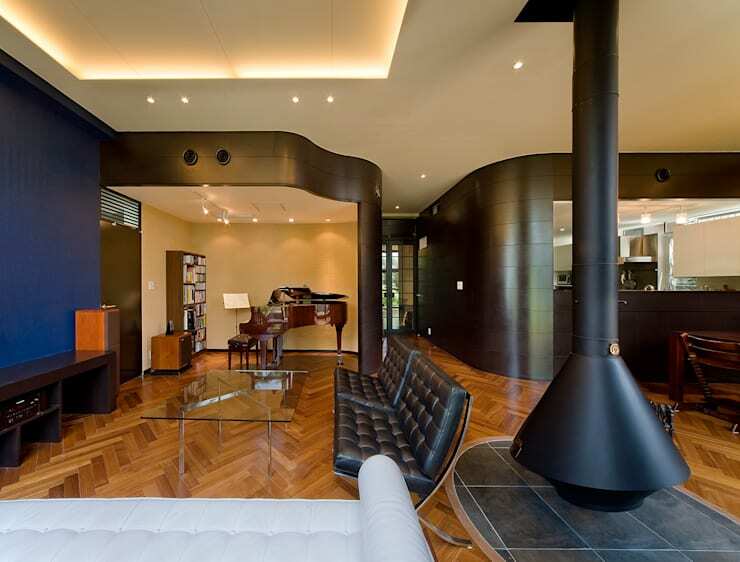 The wave-style pattern of the wooden tiles on the floor as well as the polished wooden and leather furniture create a rich and robust look in this rather modern space. 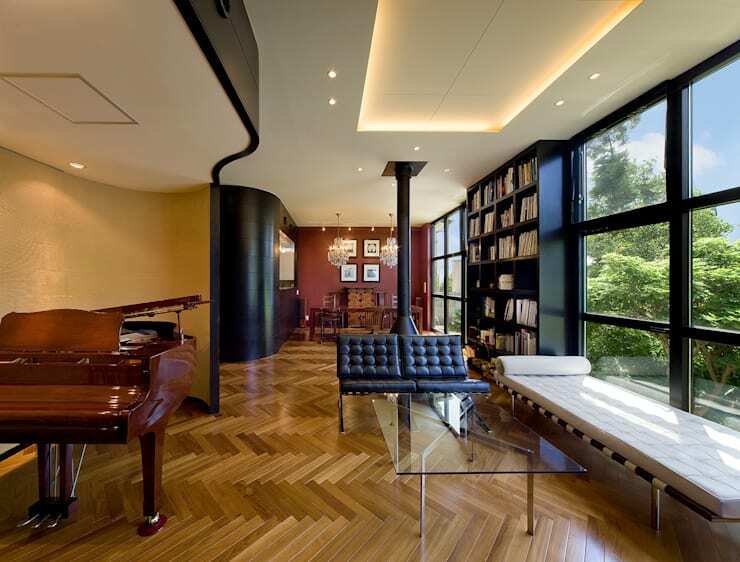 The piano makes for a whimsical and flamboyant look. 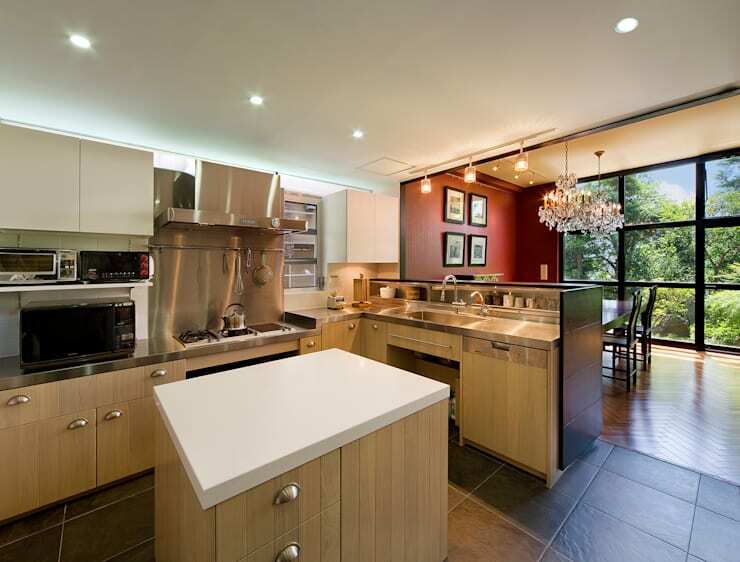 The kitchen is a large one with many classy elements at play. The stately good looks are down to the lightweight objects like the simple polished cabinets and white counters that sit in a U shape around the island of the kitchen. White cabinets and chrome fittings complete the rest of the space. The main hall has a luxurious glass wall on one side, which shows off the treetops and makes for a lush statement even when you are seated indoors. The chandeliers, the polished wooden table and the floor also adhere to this sense of luxury indoors. The colours in this space like the navy blue wall and the burgundy wall at the far end ensure that the rich yet neutral room has plenty of interesting touches. The quirky door and the staircase that suddenly appears on the floor make for a fun appeal in this home, while the moulding and the golden beige hues with the brick wall glisten with style. 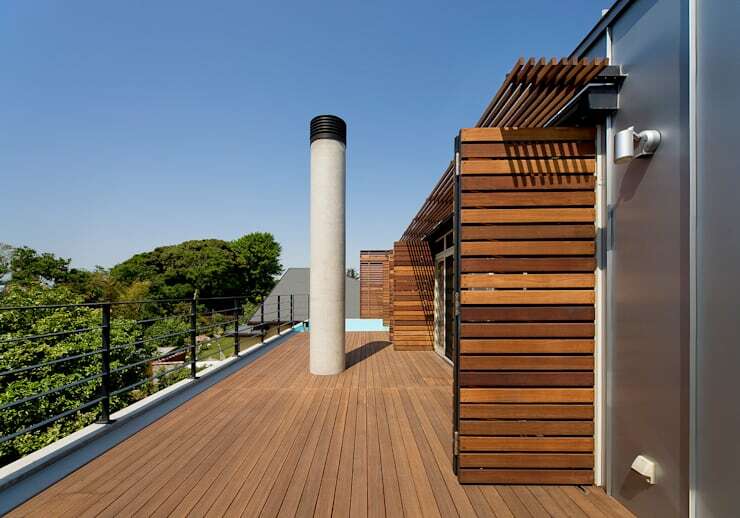 The terrace is a good looking wooden space with many planks and slats doing up the area in a neat, Oriental manner. 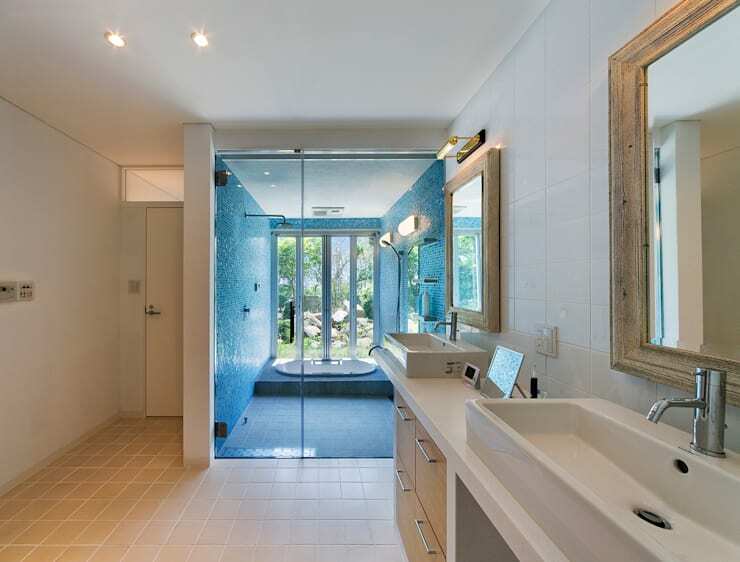 The white and distressed wooden features are balanced by the blue walls behind the glass shower stall. The garage is a study in the quirky school of design with bicycles for an art installation.